← Rest or Flee Creatures From Beyond the Grave! “There is still evil afoot, be on your guard.” Maruc did not put away his symbol, he thrust it beyond him like a shield and edged forward into the mist beyond searching for the ‘wailer’. Ludo kept his sword in hand and advanced towards the gruesome heads, He pulled a light stone from his pocket and used the light to peel away the gloom surrounding him and the ghostly visage. Well one mystery is solved at least, he swiped his sword and knocked the poles to the ground, knocking the heads loose from their perch. “Maruc I mean no disrespect to the departed, but I do not think it is right that they remain on the poles”. He felt a need to dispose of the heads but was extremly nervous – he felt like the party was being watched. I have a bad feeling about this place something is not right. A groaning laugh escaped Hasan’s thin lips. The elf shook his head, “Spirits up now, boys, we’ll find the end of this mystery soon enough, I think.” And the elf fell into rank behind the tall broad cleric. The dwarf wasn’t bothered in the least by the displayed heads and merely raised an eyebrow as Ludo knocked the poles down. He waited a moment, half expecting some manner alarm to be raised when that failed to erupt Feldard gave a grunt in response to the elf’s comment and returned to his rear guard position. Ludo rubbed his forhead, the wailing was getting on his nerves, it sounded mournful and within the mist and fog it was difficult to guess its direction and how far away it was. Ludo was certain that it was not the wind making the noise, which led him to believe that whoever decapiated the bodies was close by and hunting the party. Stephan was relieved to see the poled-heads instead of some un-worldly creatures. But his relief was by no means complete and he moved on with his party on high alert. “Be on your guard, Ludo we can care for the dead when this place is free of evil.” Maruc warned. 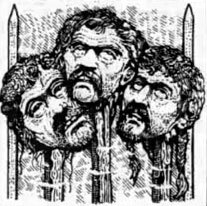 The group moved forward through the mist, and saw the outline of another set of impaled heads. Then another, and then more still. The entire place was filled with impaled heads. The wailing continued. Hasan’s keen vision focused in on one of the decapitated heads. He narrowed his eyes. Were those…bite marks? Before any more exploration could be done, two hideous creatures burst out from a hidden tunnel entrance near where Stephan and Miklos were standing. They were on top of them immediately. Stephan’s armor protected him from the ghoul’s bite, but Miklos had no such protection to offer. The ghoul sunk his teeth into the mage’s shoulder. Miklos cried out, but his voice faded as consciousness left him. The undead beast dropped the paralyzed spellcaster and his eyes darted about in search of new prey. Feldard gave out a bellow of alarm to warn the others ahead “We are attacked!” and charged at the undead creature standing up from the unconcious mage. The dwarf swung his axe blade up and over his head to come down hard on the ghoulish creature. The magical blade bit deep. The creature’s scream rang in the party’s ears has it fought back fiercely. Ludo sprang into action holding the lightstone before him as a deterrent. He darted to the cloesest undead creature and thrust his sword into its chest and felt it cut through rotten flesh. Withdrawing his sword he saw a gallop of sickly green liquid erupt from the creature and land on the ground next to Miklos. Stephan was late getting his hack in but soon joined Feldard and Ludo in the attack. Rolling to his feet, he found himself facing a ghastly visage. The large eyes though vacant burned with pure hate. The gaping maw screeched an ear-splitting wail. A sickly old, dry smell emanated from the mouth in a cold stream. The scrabbling creature attacked with unnatural vigor. Pushing with his shield, he was able to keep the thing off him for a second. But the grasping dead fingers held tight to the shield weighing it down with a sudden twisting motion. This sent the Traladarian sprawling into the dark mud with the thing still flinging itself about trying to get at his neck. He felt hard dry fingers scraping at his flesh but somehow managed to free enough space to strike with his blade. The sword cut into the animated flesh sending a strange reverberation up the woodsman’s arm. The blow successfully removed the fell being’s left arm but had no effect on it’s seeming bloodlust. With an erupting wail, it again leaped Stephan. Miklos felt the cold touch of death creep down his shoulder and toward his heart. The chill spread and his useless knees buckled, he was grateful that he would not be awake when they feasted on him. Hasan recoiled at the sound of Miklos’s gasp. The elf’s sword glinted menacingly, but there was no room to swing it in the tight scrum in front of him. “Maruc, go now, and look to these creatures. I will watch for others,” the elf insisted.